Former Top Gear presenter Jeremy Clarkson has apologized to Oisin Tymon – the show producer he punched last year – after settling a £100,000 ($140,000) racial discrimination and injury claim. 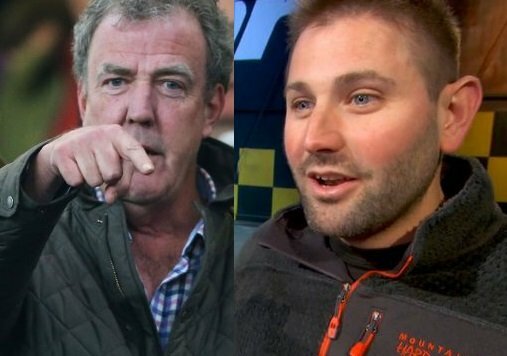 Oisin Tymon launched the action against Jeremy Clarkson and the BBC after a “fracas” last March that left Tymon with a bloody lip. “I would like to say sorry, once again, to Oisin Tymon for the incident and its regrettable aftermath,” Jeremy Clarkson said. Jeremy Clarkson, 55, was dropped by the BBC following the assault. The former presenter added: “I want to reiterate that none of this was in any way his fault. Oisin Tymon’s lawyers said the case had been settled but did not give details of the settlement. It is understood to be in excess of $140,000, an amount to which both Jeremy Clarkson and the BBC contributed. The “fracas” took place at a North Yorkshire hotel after Jeremy Clarkson was told there was no hot food available at the end of a day’s shooting on location. An internal BBC inquiry found Oisin Tymon was subjected to an “unprovoked physical and verbal attack” by Jeremy Clarkson, who called the producer “lazy” and “Irish” and used a four-letter expletive in the exchange. At the time of the attack, Oisin Tymon told police he did not wish to press charges. In the days following he was the subject of sustained abuse on social media for his involvement in the dispute.